I'm working on converting all the IUP examples that come with the distribution to C BASIC. 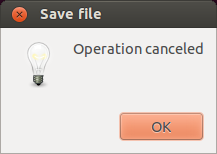 The Alarm example shows a typical dialog that would be used when closing an application with unsaved files. This is a IUP button example showing how button events are captured, adding an image (from code) that toggles with the button state. The second image shows the button disabled. The big useless button state is printed to the console. (left/center[wheel]/right) Notice that the title bar system buttons are also disable (hidden) along with the ability to resize the window. The next example in this series is how IUP places its controls using its containers and controlling auto sizing of controls. I'm going to have to create a custom demo as these features are currently spread out over a few examples.